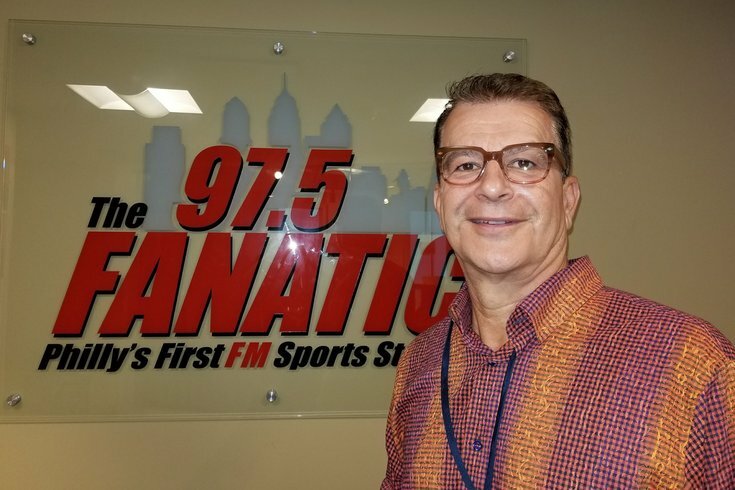 Mike Missanelli standing outside the 97.5 The Fanatic studio where he hosts his daily afternoon show. Missanelli admitted Friday that he lost his weekly 6ABC spot after questioning on his 97.5 show why ESPN felt the need to have a female announcer call an NFL game. Mike Missanelli admitted Friday that he was fired from his former Sunday night gig with 6ABC because he questioned the need for a female play-by-play announcer to call NFL games. Speaking during his radio show on 97.5 The Fanatic, the sports talk host said he was dismissed from his regular spot on "Sports Sunday" last month for saying it was "unnatural" to hear ESPN broadcaster Beth Mowkins call an NFL game, Crossing Broad reported. Missanelli claimed he was trying to "stimulate conversation" when he made the comment. "Sometimes you get trapped into trying to stimulate conversation on touchy subjects," Missanelli told his listeners on Friday. The comments sparked a backlash from "haters" on social media, he said. He also acknowledged that he later walked back the comment and was out of line. 6ABC declined to comment Friday when asked about the situation. The station is owned by Disney, which also owns ESPN. That didn't help things, Missanelli indicated. "I have nobody to blame but myself," he said. "Did I think it was a harsh result? Yeah, I did think it was a harsh result. But I was the one who said it, so I took the heat." Missanelli hosted the show with sports anchor and reporter Jamie Apody.